These valves are designed to control the mixing of hot and cold water and deliver it at a constant, pre-set temperature. 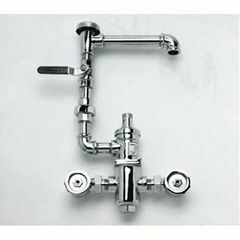 The valve is equipped with a union end, loose key, angle stop, check vavles with built-in strainers and vacuum breaker. The -MXT3, -MXT4 and -MXT5 units are also furnished with a built in thermometer. Control valve is set to deliver water at temperatures up to 115 degrees Fahrenheit. Failure of the cold water supply will cause the hot water supply to close, eliminating any possibility of scalding. The -MXT1 and -MXT2 are recommended for use on stationary models, while the -MXT3, -MXT4 and -MXT5 can be specified for Full Body Immersion Tanks.